For people who are looking to spend money on products or services, it can often be difficult to know which one to choose. When presented with a few different brands, consumers often go by packaging or price when deciding which brand they will buy from. Whilst these can be good indicators of the quality of a product, they don’t always give consumers the best product for them, or the additional details they need to choose the best product for themselves. This is where customer testimonials come in. Read on to learn more about the power of customer testimonials in growing your business, as well as how to get more of them from your happy customers. 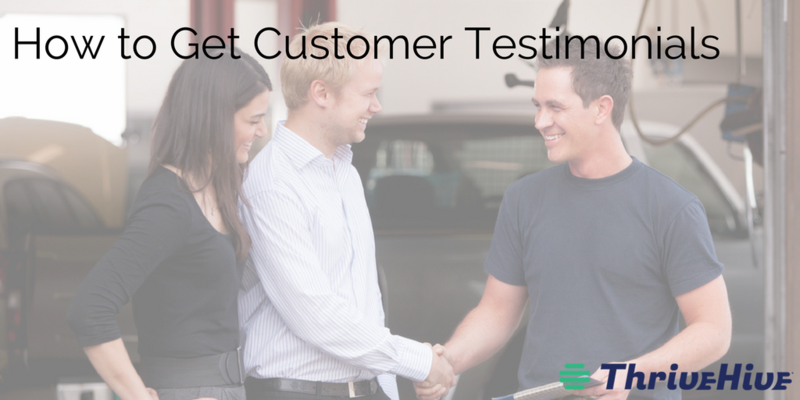 Customer testimonials are comments, reviews, and descriptions from your existing customers. By hearing about the experiences of those who have already used the product or service, consumers can make a more informed choice about where to spend their money. Testimonials are also a great way to show that your business is legit. According to Nielsen, “92% of people will trust a recommendation from a peer, and 70% of people will trust a recommendation from someone they don’t even know”, showing just how important customer testimonials are. By creating a Facebook page for your business, and setting it up as a local business, you allow people to leave a review for your business. With Facebook being so popular you would be hard pushed to find an internet user without a Facebook account. This means it is easy for both researchers and customers to read and leave reviews. The easier it is to leave a review, the less you’ll find yourself having to encourage people to leave them. Depending on the type of business that you are and the type of product or service that you are selling, there might be other social media platforms which you can use to allow people to leave testimonials. It might be that your potential customers as a group use a different social media platform more frequently. There are a number of review sites where you should get listed. Yelp, Google Maps, Yahoo Local, CitySearch and Merchant Circle are some good examples. Not only will customer testimonials on these sites help to attract more customers, but your listings can also help with your online presence and SEO. Furthermore, many online directories pull information from each other (including testimonials) so it is worth getting listed. You can also copy these testimonials onto your website testimonials page if you wish to. It is also possible that your industry has its own niche listings sites, so be sure to look into creating and updating your listings on there as well. “Testimonials” can sound a bit too official for some people, but if you ask for “feedback” instead you may get a better response rate. There are a number of ways to collect feedback from your customers, such as through email, Google Forms, Survey Monkey, and social media polls. By asking more specific questions, you save people the effort of figuring out where to start, what to talk about, and how to articulate their experience—which can be barriers to entry for many customers. In addition, the anonymity of these surveys can help you to achieve more honest feedback as well as a higher response rate. At the conclusion of the survey, you might even want to ask them to leave an subsequently ask them to leave you a review on one of your other listings, while the words are still fresh in their minds. If you have any loyal customers with whom you have a strong relationship, you may want to ask them directly if they will do a success story with you. Many people feel awkward and hesitant asking, as it may feel like a one-sided request. However, success stories about customers who have truly benefited from your business are not entirely self-serving. Yes, they highlight how awesome your business is but they also help other potential customers to discover your business, make an informed purchasing decision, and experience those same benefits. Success stories help your business to tell its story, of which your customers are a vital part. By thinking of success stories in this sense, you may feel more comfortable asking a long time customer to help you create one. It is important that you ask for a testimonial at the right time. This is the key to getting a decent review. You want to catch your customer at the time that they are happiest with your product or service. Depending on your business, this might be right away or after some time. By understanding when your customer is likely to be happy to give you feedback, you can make sure that you approach them at the right time, in the right way. It might mean sending a feedback form out with the invoice for some businesses, for example, or a follow-up email a few weeks down the line for others. There are a million and one different ways to get people to leave you feedback. Your imagination is the limit. For example, if you are in a brick and mortar location, you could hang a chalkboard, inviting people to leave feedback about a specific question. Like, “What did you enjoy the most about your experience today?” Don’t forget to monitor it of course, but this type of idea an excellent way to get feedback – as well as make an interesting piece of content that other customers can enjoy in the future. You could also set up an online review station within your physical location, allowing people to log in and write a review whilst they are in the building. Getting customer testimonials can sometimes be difficult for businesses, but it is an important aspect in attracting new customers. By making it easy, comfortable, and even fun for them to do, you give yourself a better chance at getting the customer testimonials that you need to see your business grow from strength to strength.